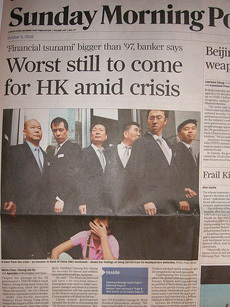 A Chinese newspaper covered protests in Hong Kong after the fall of Lehman Brothers. Anchor Martin Savidge describes the indelible images and fundamental questions behind Worldfocus’s reporting on the global financial crisis. It’s a phrase we use a lot these days, especially when we cringe over the latest news from Wall Street. This huge financial crisis has, in many ways, reminded us all of how interconnected we are — especially financially — from our economies to our portfolios. Perhaps the most poignant reminder of this was a report from our partner Deutsche Welle about a little old lady who would check her portfolio on her laptop — woefully and daily. She lives in China and “invested” half of her entire life savings in a company called Lehman Brothers. From where I sit each evening, I get to track world events as they unfold. Lately, it’s all about the economy. The financial crisis has been our lead story just about every night. Every morning our staff comes together to see how our partners around the world show and explain the problem to their audiences. So far, we have included reports from Asian News International, Indian TV, Al Arabiya, Dubai TV, ABC Australia and ITN of Britain — just to name some of them. In our newsroom, we try to understand these fundamental questions. We are watching the financial crisis radiate in markets around the world, and we’re looking for the connections. For instance, we followed the significant decline of the petro-dollar-rich Middle East markets. In listening to and watching the footage, we found that the only differences from Bloomberg to CNBC and Dubai TV were the languages spoken (Arabic) and the business attire worn (headdresses and dishdashes — long, one-piece tunics worn by Arab men). Just like that little old lady hovered over her computer in a corner of China, we’re all affected and we’re just trying to make sense of it all. No region, no country, no market is immune — at least, not any more. Photo courtesy of Flickr user nocklebeast under a Creative Commons license. Who can we trust with our money? No one at this time! Why? There is no true leaderships among our political leaders, civic leaders and financial leaders around the globe! Corruption, greed, pay-offs, inside trading (information or tips among people in the financial world)and lobbyists buying our elected officials (most of them have taken money and favors from those lobbyist in Washington, D.C. and state and local governments). This week was the worst economic crisis the world ever seen! This finicial melt down was due to the greed, inside trading (this stuff is going everyday of the week),corruption, lack of finial control and integrity on Wall Street and other stock markets around the globe! It is about high times that the US Government and nations around the globe come down hard on those who were criminally responsible for this finial cal and econmic mess that they got us into! I wonder why stock holders around the globe have never objected to the trillions of trillions dollars of (pay-off}”Golden Parachute” and bonuses that were paid to CEO’s of companies around the globe? The US Treasury gave AIG 85 billions to stay in business. What they did when they got this huge bill out? AIG executive spent about 1/2 dollars on fancy hotel and high-class perks. They still living the high-class life-style. What these tell us? That 750 billion dollars “bill out” that the US Government and, other hundred of billions dollars that other nations will pay to help the world credit markets to get back into normal lending operations will be abused by the high-class brokers and CEO’s around the globe! Yes my friends, the gravy train of greed, corruption, inside trading and golden parachute(s) will be as business as usual! These bankruptcies taking place, livelihoods and people’s security destroyed are all frightening. Everyone’s waiting for that figurative “knock on the door” to find how badly all this will affect them. The only positive thing I’ve experienced is that I’ve been getting an extended economics lesson, learning about what happens when huge corporations are deregulated and permitted to use derivatives to absolve themselves of the responsibilities of business decisions their representatives made. Unfortunately, the main things derived from derivatives has been great wealth for some individuals and, per, the destruction of a world economic system.